Kramer artists of the day included Vivian Campbell, Edward Van Halen, Jeff Golub, Brad Gillis, Neil Schon, Richie Sambora and others—and the Kramer Pacer was the flagship of the range. Patterned after the elegant offset-double-cutaway body and “beak” headstock of the original, and locked and loaded with a pair of premium Seymour Duncan™ pickups and a Floyd Rose™ tremolo bridge, the Pacer Vintage is available in your choice of four metal flake finishes: Candy Red Metal, Emerald Green, Candy Yellow, and Magenta Metal. From its solid maple body to its bolt-on hard maple neck with maple fingerboard, the Pacer Vintage loads in a premium tone wood that is known for optimum resonance, clarity and sustain. It is all crafted into one supremely playable package, too, with a thin-taper elliptical neck profile and 22 medium-jumbo frets on a ’board with a 12” radius for the optimum marriage of comfort and easy bending. 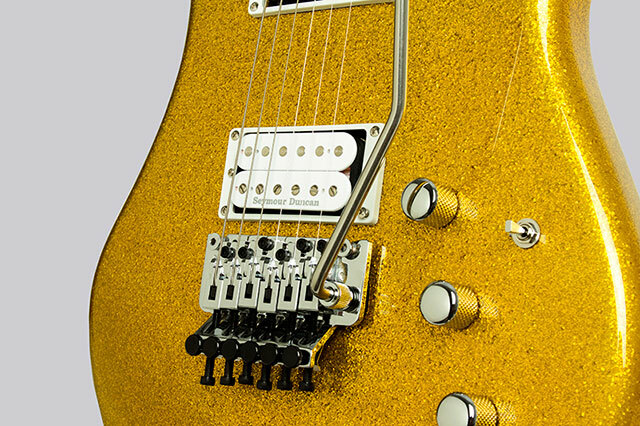 Another crucial Kramer touch is the 25 1/2” scale length that many shredders prefer, which offers tight, thumping lows and shimmering harmonics. A high-output Seymour Duncan™ JB® humbucking pickup in the bridge position and a more vintage-voiced JN® in the neck provide the Pacer Vintage with the optimum firepower and versatility. Both are made with genuine Alnico V magnets and wound with 42-AWG copper wire with a DC resistance reading of over 16K ohms. The result gives you everything from scorching lead tones to massive crunch, but always with plenty of clarity and excellent note definition. The JN® in the neck reads a cooler 7.74K ohms for smooth, warm tones with impressive articulation. They are controlled by separate volume pots with a push/pull series/parallel tap and a .002mf cap bleed mod on each for endless tonal possibilities. For unbridled whammy action, just grab on tight to that Floyd Rose® tremolo unit—partnered with a locking nut up top for outstanding tuning stability—and give it all you’ve got, for anything from evocative dive bombs to gently warbling tremors. A set of premiums die-cast tuners with efficient 14:1 gear ratio complete the hardware package, which includes a hardshell case. Check out the Pacer Vintage today at your authorized Kramer dealer, and dive into the golden era of high-performance shred. The Pacer Vintage is made from solid maple, a premium tone wood that is known for optimum resonance, clarity and sustain. It is available in your choice of two high-gloss finishes: Honey Burst with chrome hardware, or Orange-Yellow Burst with a tiger graphic on the front and black hardware.